NETWORK FINALS: There were 0.1 drops for 20/20 and both reruns of PENN & TELLER: FOOL US in final numbers. CABLE HIGHLIGHTS: The Friday of Memorial Day weekend was quiet on cable, topped by Adult Swim’s midnight NEON JOE, which was up 0.09 from Thursday’s installment to 0.47. Nickelodeon’s noon PAW PATROL was next at 0.37. The highest-rated primetime show was VH1’s RUPAUL’S DRAG RACE, up 0.04 to 0.35. 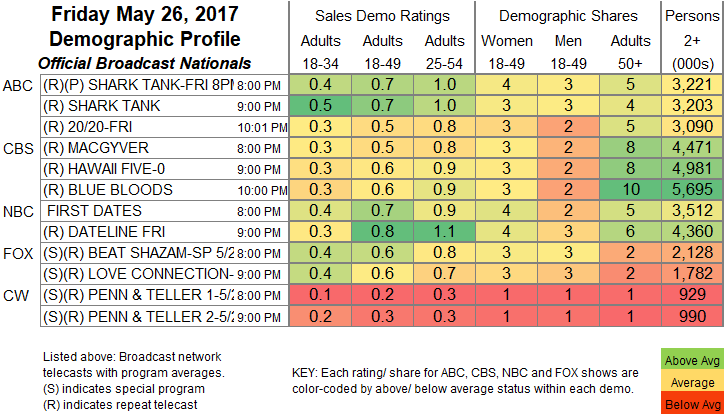 A&E is now rating LIVE PD in half-hour segments, which were at 0.30/0.29/0.28/0.24, below last week’s 0.36/0.35/0.34/0.33. History’s ANCIENT ALIENS rose 0.07 to 0.29. MSNBC had 2 shows tied in the Top 10, with 0.26 scores for both 11TH HOUR WITH BRIAN WILLIAMS and THE RACHEL MADDOW SHOW, although Maddow had the edge in total viewers, 2.2M vs. 1.8M, with both of them ahead of Fox News’s TUCKER CARLSON TONIGHT (0.23/2.5M) and CNN’s ANDERSON COOPER 360 (0.23/1.1M). 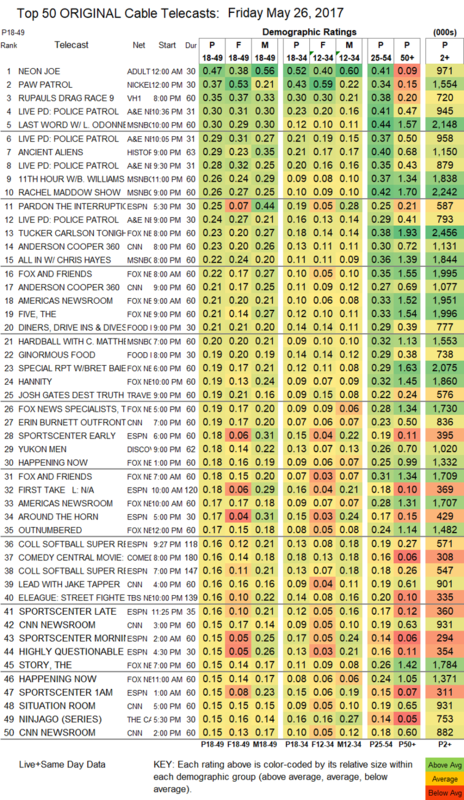 Food Network’s DINERS, DRIVE-INS & DIVES was at 0.21, and GINORMOUS FOOD ticked up to 0.20. Discovery’s YUKON MEN was steady at 0.18.